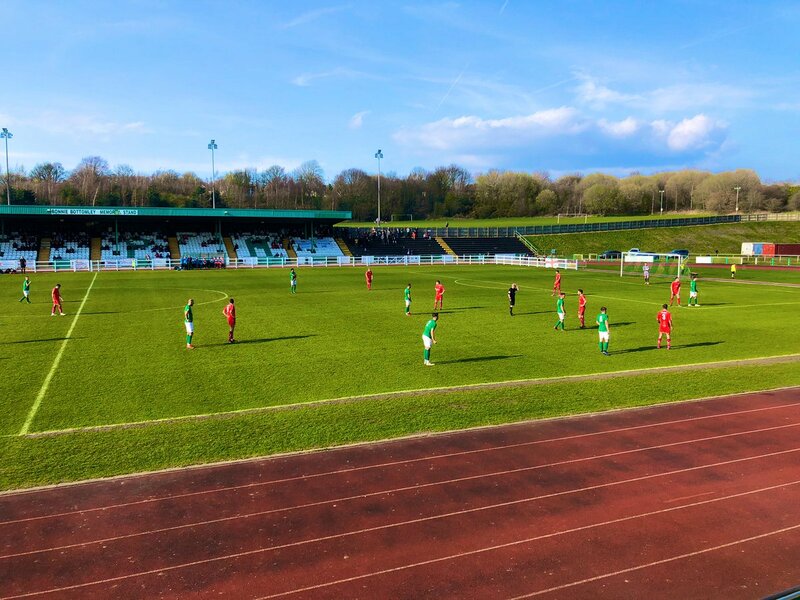 Reece Styche's second half overhead kick was cancelled out by Havern's half-volley with four to go, as the Reds missed out on three points at another top seven side on Saturday. Billy made two changes to the side that drew with Spennymoor the Saturday prior, Dec Bacon and Adam Curry both came in to start. Reece Styche and Nathan Hotte returned to the bench. The game started in a tight fashion with both sides looking to get hold of the ball and dominate the midfield area. We were in a structured shape with Curry, Luke Shiels and Martin Riley sitting in a back three with Josh Wilde and Josh Clackstone looking to bomb down the flanks. Curry was alert to clear an early ball in from the right before a run down the same side brought a Reds goal kick. Sam Ramsbottom was called into action after five minutes as he held onto Knight's rising effort with the Avenue winger wriggling free on the edge of the box. The hosts then shouted for a penalty when we couldn't clear a low cross from the left, the turn from the Bradford player looked to be begging for contact with no delibrate contact actually being caused. Alfreton were still trying to find their way into the game and were under heaps of pressure with Bradford dominating the ball. Sam raced out well to a long ball to deny Johnson gaining any contact before Beesley was caught offside with his charging run down the right, lucky for us the flag was raised with Johnson unmarked from the resulting cross. Beesley then fired one into the side netting at the far post from a lovely cross-field pass before we caused a first moment of panic for the hosts with around 22 minutes gone. Bobby Johnson's corner was only half cleared and fell to Bacon whose shot was blocked via a face and then cleared. We then should have taken the lead when Jordan Sinnott played a beautiful ball through for Bacon who found himself one on one with the goalkeeper Andrew, but the hosts goalie denied Dec with a sharp stop. Clackstone then headed over the bar from a few yards from Danny Clarke's cross on the left. Sinnott hit a rasping drive just wide of the post before the Reds had more chances with Clackstone's effort being blocked from Bacon's lay-off, the attack continued as Shiels headed Platt's cross inches wide of the far corner. The interval brought disappointment for the Reds who should have at least been 2-0 up in the contest but there were plenty of positives with Alfreton stretching another top seven side to their limits. The second period saw early defending for us to do with Clackstone clearing the ball away after Sam Ramsbottom's clearance hit Johnson in the box. Another scramble ensued from Sinnott's corners with the first being headed away before the second nearly saw Shiels and Riley make contact. Bacon came close again with an effort which went just wide of the post before Johnson had two brief sighters but Sam was alert to stop the crosses at the near post. Bobby nearly flicked us in front as he rose to meet Curry's floated pass, Bobby won the header ahead of the on-rushing Andrew but the ball went just over the bar. The game was in the balance with both sides still looking to find the first goal, the Reds were getting closer without being overly troubled at the other end. Reece Styche and Richard Peniket were introduced and had an immediate impact with the hold up play and combinations effective. Knight delivered a good cross from the left which went straight across the face of goal but with 75 minutes gone we finally took the lead and yet again it was fully deserved. Clackstone's long throw found Shiels who hooked the ball over to Styche who hit a wonderful overhead kick from close range which nestled into the far corner. It was a truly outstanding finish and the Reds efforts paid off. The momentum was with us and we had two clear penalties turned down with Clarke being tagged from behind as he got a shot off in the box before Styche was taken out after his quick feet took the ball away from the defender. Bradford pressed late on and Sam produced lightning quick reactions to hold onto a header at the far post before he denied Potter's curling strike. But with 87 minutes gone, the hosts did level when Havern struck a sweet half-volley into the corner from just outside the box to the frustration of the Reds. And that proved to be the last major action with Alfreton denied late on, another three points. Full time thoughts certainly looked towards missed chances in both this game and at Spennymoor, which if we had taken these; we could have grabbed six points instead of two from two tough away trips. The Reds will be full of confidence despite these two draws and will look for a seventh league game unbeaten with the visit of sixth placed Altrincham to the Impact on Saturday, kick off is 3pm. ATFCXI: Ramsbottom, Clackstone, Wilde, Platt, Shiels (c), Riley, Bacon (Peniket 58), Johnson, Clarke, Sinnott (Styche 67), Curry (Hotte 71). Subs Not Used: Nicholson, Lynch, O'Brien.